My favorite fabric for fall without a doubt is velvet. Hold the gasp! It is my belief that velvet’s reputation was ruined when crushed velvet came into the mix. Be careful not to confuse the two, velvet is cozy and classic while crushed velvet is the ugly duckling. A wardrobe staple becomes an instant classic when done in velvet. It is comparable to a trench coat or Chanel bag. These are simply things that stand the test of time and never go out of style. 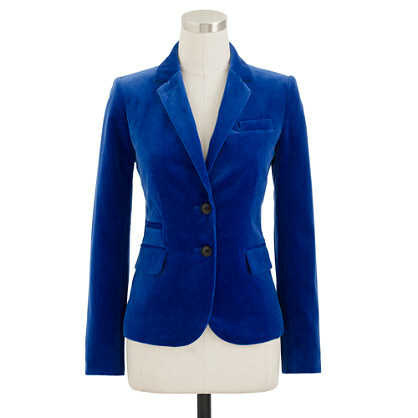 For instance, this fitted blazer from J.CREW comes in a variety of colors but its velvet texture further preserves this classis style. Keep in mind, velvet works best on already traditional items such as a blazer or a loafer. I would recommend staying away from trendy items that can look tacky before you get your use out of them. This fall be sure to incorporate a classic velvet piece into your wardrobe and enjoy it for years to come!